Coffee is the start to many people’s days, but how good is it for you? Take a look at the reasons why coffee is good for you. It will outline different health benefits that regularly drinking coffee will have on your body and mind, so you can drink your favourite beverage with a peace of mind. When drinking coffee on a daily basis it can aid with the digestive process. This is down to the coffee stimulating the digestive tract, making it contract more, causing the food and excess waste to move through with ease. It can serve as a laxative at times as it can unblock you after drinking just one cup. But when drinking coffee in excess, it can be harmful to your digestive system. So if you do not drink your coffee to excess you will be fine and it is very beneficial. Coffee is a rich source of disease-fighting antioxidant. Studies have shown that it may help to reduce issues such as headache and cavities. Not to mention, it can help to improve your mood. Coffee is a natural way to get these antioxidants into your body although you should also eat fruit and vegetables to get more protection. Why? because just one type of antioxidant cannot protect your body against everything. Despite this, coffee is the largest source of natural antioxidants and are very helpful for your health when you drink it on a regular basis. Coffee contains much needed fiber that is necessary for your digestive system. An adult male needs between 30 and 38 grams of fiber a day, whereas adult women need slightly less with 25 grams a day. Your average cup of coffee contains 1.8 grams of fiber so would be useful to add to your daily intake of fiber. When thinking about this intake, you cannot just take into consideration coffee as it would be unhealthy to just get it from coffee. Other high in fiber substances are vegetables, fruits and beans, so make sure to even out your diet, but starting your day with a fiber-rich cup of coffee is certainly not harmful to you. Black coffee can be very beneficial in the prevention of cavities in your teeth. This does not count if you drink coffee with sugar and milk in as these will not be good for your teeth. The black coffee contains antibacterial and anti-caries that prevent the tooth decay when not being consumed to excess. As always, it is good practice to rinse your mouth after drinking coffee like the doctor advise! Caffeine in coffee makes you feel as if you are more energised, this is because you are. The caffeine blocks certain neurotransmitters in your brain so you feel much more awake and less tired. Although when drinking coffee short term this may help, if abused it can cause side effects, like withdrawal, that will leave you craving the energy. The average person should consume 400 mg of caffeine a day so you could really have up to 4 cups a day (average cup contains 95 mg) without going over your daily dose. The caffeine in coffee can help with reducing the amount of fat in your body. This caffeine contains stimulants that increases metabolism slightly to burn fats. It means your body will automatically break down fat at a slightly quicker rate than usual, helping with weight loss in the short term. Coffee gives you the boost in energy that you need to kick start an exercise session, further aiding weight-loss in an indirect way. In cases of people with anxiety and depression coffee might be able to help. It releases dopamine into the prefrontal cortex, which helps to elevate your mood. This certainly can help those with depression as the dopamine is commonly associated with the feeling of love and happiness. Levels of dopamine in those suffering with depression and anxiety is often very low, so this could potentially help raise those levels and help with your mental health. Coffee has been shown to have a huge effect on your liver when consumed regularly. Results have been calculated that the beverage contains compounds that form a protective layer inside your liver, to stop harm from junk food and alcohol among other things. These compounds also help to stop damage to the tissue, stopping liver failure in the long run. Even in small amounts, coffee can be beneficial in stopping these problems. So enjoy your morning cup of coffee with the knowledge that it is helping to stop your liver from encountering problems such as cirrhosis. Parkinson’s is a neurological illness that affects people’s movements that is currently incurable. Studies about the effect of coffee consumption in relation to preventing Parkinson’s disease have been going on for years. Good news is they have shown results regarding the caffeine in coffee and its effect on someone’s brain. When someone drinks on average 3 cups of coffee a day their chances of suffering from Parkinson’s. There could even be a risk reduction of 80% when regularly drinking up to 4 cups of a coffee a day. This is a massive reduction and could help prevent against a disease that affects a significant amount of people. When you brew your coffee in the morning, the natural goodness and nutrients are absorbed into the water. Several vitamins and minerals are among these nutrients and when consumed regularly are very good for you. Common nutrients found in coffee are calcium, magnesium, vitamin B-5 and vitamin B-2 and they all help your body in different ways. Vitamin B-2 is used to breakdown other nutrients in your daily diet helping you to absorb all the goodness, vitamin B-5 helps with your digestion. Calcium helps with communication between your nerve cells. Magnesium helps with the contractions in your heart. All of these together will make for a happy healthy you. Studies have shown that regularly drinking coffee or consuming caffeine can be extremely beneficial for your memory. A study in 2015 that involved participants taking pills with different levels of caffeine in, over a period of time, showed that regularly taking in at least 200 mg of caffeine is good for your memory. This is down to the caffeine blocking a molecule that stops a hormone in your brain that benefits memory. This means that if you enjoy at least 3 cups of coffee a day, that your memory will hopefully get better due to the caffeine in the drink. For years coffee has been thought to be bad for your heart, but recent studies have shown that it can actually be good for it. Drinking coffee regularly can reduce inflammation in your heart due to the anti-inflammatory phytochemicals within the beverage. That said, there are always new research that claims that it good one day and bad the other. The key to reap positive benefits is moderation. Keep that in mind and you would be on the better side of the coin. Coffee, in particular the caffeine in the coffee, is often seen to be bad for your blood pressure, raising it significantly. Even though the beverage does raise your blood-pressure in the short term in people who don’t regularly drink it. This is due to them not being used to the sudden burst of caffeine. However, if you drink coffee regularly, you might not be as at much risk at first thought. Your body gets used to the amount of caffeine so your blood pressure more or less stays the same. Regular coffee drinkers are no more like to have high blood pressure than those who do not drink it. That said, it is often advised for those that have existing high blood pressure condition; refrain from drinking coffee. Gout is caused by the build-up of certain acids in your blood, leaving you with discomfort in your joints and inflammation, meaning your feet or hands would swell up uncomfortably. Coffee has been known to help prevent the build-up of the acid in your blood by reducing the amount of uric acid that is present. It has been shown that if you drink 4-5 cups of coffee a day, your risk of getting gout is reduced by up to 59%. This effect is mainly seen in heavier coffee drinkers and if you only have 1-3 cups of coffee your risk could only be reduced by up to 8%. But this is no way asking you to force yourself to over-consume caffeine. The caffeine in coffee could help you to reduce pains that you may have. Caffeine is used in many medicines around the world and has been known to help the effectiveness of other painkillers. When caffeine is present, it allows the medicine to get into the bloodstream faster, which in turn makes the painkiller work its magic faster. If you are a regular coffee drinker, you may need to up your dose by maybe a cup a day to notice its abilities as a painkiller..
Coffee could reduce your chances of getting Alzheimer’s according to new studies. This reduction could be by up to 50%. Alzheimer’s is an illness that causes your mind to deteriorate and it affects millions of people, usually older people, across the world. The caffeine in coffee has been seen to reduce the risk of cognitive impairment, leaving you with a healthier mind overall. While most people drink coffee in order to keep themselves feeling more energised and alert. Scientists have uncovered that coffee could actually also reduce stress levels in your brain. Which kind of happens like everyday due to all kinds of small stuff. This is due to the way that it affects neurotransmitters in your brain that help you to fight stress and diseases associated with it. So don’t sweat the small stuff but if you do, drink some coffee. Take a break. When performing an athletic sport, coffee could benefit you. This is down to the caffeine in the coffee, it can make you think more clearly and make you more driven. The caffeine can help you to perform better by up to 12% in longer events compared to shorter ones where there was not a noticeable difference. This is because the athletes are able to concentrate for longer, pushing them to do their best. Although it has worked in some cases, it may not help you, and the effect will be more noticeable in non-regular coffee drinkers. There is now substantial research that shows coffee might help with the prevention of type 2 diabetes, although it could make it worse if you already have it. Diabetes is a disease that is caused by your body’s inability to breakdown glucose in blood. In a recent study, spanning over a number of years, it was shown that those who increased their coffee intake by a cup a day reduced their risk of getting diabetes by 11%. Of course if you add coffee and milk, this could increase the risk. Give and take here people. No, drinking 3 cups of coffee a day is not going to automatically make you smarter, although it does increase your chances of being able to make yourself being perceived as smarter. This is because the caffeine allows you to spend more time learning as your brain is much more switched on. Coffee also causes different parts of the brain to process information faster and it will let you access more parts of your brain at one time. Some of the benefits of coffee already mentioned in this article will also help with your intelligence, such as lowering the levels of stress. Regular bowel movements are a very important factor when thinking of a healthy body. Coffee can cause certain people to move their bowels after drinking it, and this is because the caffeine makes the colon to push out waste. Although the reason why this happens isn’t clear, it is more than likely due to the acidity of the coffee affecting the colon, causing this to happen. So if this happens to you, it is very natural and just means that your bathroom breaks are beneficial to your body. Recent studies have found that those who drink more than 4 cups of coffee could halve their risk of getting mouth and throat cancer, although there has not been much research into the topic. This is due to the antioxidants that are in the coffee that can prevent or merely slow down the effects of cancer. As the coffee is present in your mouth or throat usually, this means these areas are affected more. 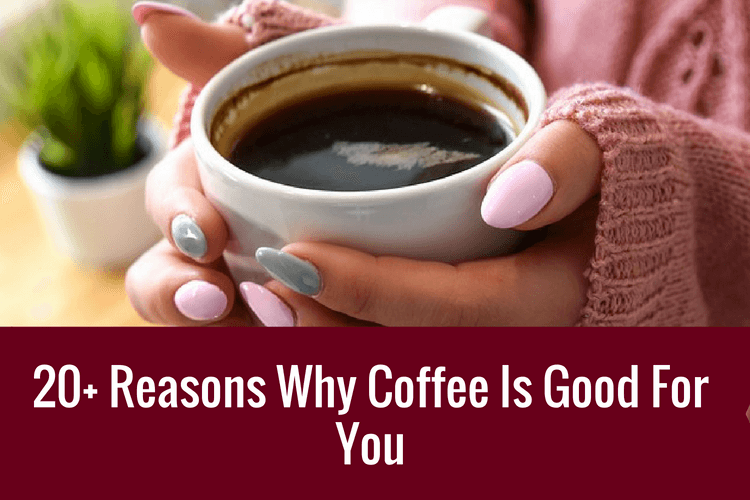 A lot of the points made in this article have shown that there are benefits to coffee and studies have shown that coffee may generally help you to love longer. In a study of 450,000 people, researchers found that men were 12% less likely to die from lifestyle diseases when drinking high amounts of coffee. The same study showed that women were 7% less likely. Although there are other factors to consider, it does show how coffee is definitely beneficial to your health. Overall, we has shown many different ways that coffee is beneficial to your life. Be it through the prevention of diseases or just to help move your bowels, there are different ways that the bean based beverage will help you. Although drinking coffee regularly can be good for you, you must not drink it to excess or you will start seeing negative effects. Most studies show that 4 cups a day is best for you but exceeding this could be harmful. But really you shouldn’t worry when drinking your morning cup of joe.